Keto Ice Cream Recipes - "Rich & Creamy" - Easy to Make at Home! Missing Ice Cream on your ketogenic diet? Great news. 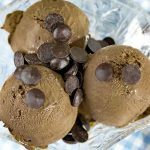 We have the best keto ice cream recipe for all of the chocolate and ice cream lovers out there. Follow the links in the page for the other Keto Ice Cream recipes. Heat the heavy cream and vanilla in a saucepan over low heat until it reaches 50C/122F, then remove from the heat and allow to cool to 40C/104F. Whisk the egg yolks with the erythritol until the yolks are pale yellow, add the cocoa and mix well. Pour half a cup of the warm cream into the eggs and mix well, add the remaining cream and ensure that all the eggs and cream are combined. If the cream is too hot it will begin to cook the eggs and you will have small lumps of egg yolk in your ice cream. Pour the mix back into the saucepan that was used to heat the cream and place over low heat to thicken. To thicken the custard, use a low heat and stir continuously. If the mixture heats too quickly or unevenly the eggs will cook and scramble. This step can take 10-20 minutes. The custard will be ready when the mixture coats the back of the spoon without dripping off. Pour the custard into container and place in the fridge, to help it cool quicker I recommend giving it a stir every 10 minutes. Depending on the size of your container it can take anywhere from 20 minute to 1 hour to completely chill. Pour the cold custard into your ice cream churner and let the machine work it's magic. You will have delicious ice cream in under 30 minutes. When the ice cream is the consistency of soft serve pour it into a container and place in the freezer, leave it for at least 15 minutes to harden up and then enjoy.